Smith continued scribbling in the notebook Mel had so generously provided even as the three Earthlings exited the forest. Mel walked behind Smith, still gripping his sword as it bobbed in the jury-rigged sheath at his side. Carla was the only one of the three who was actually looking where they were going, which worked out as her perch on top of her uncle’s head was the best vantage point to serve as lookout. Over the past few days, Carla had been working on her pronunciation to the point where it was clear even to Smith what she meant when she declared that they had arrived at a desert. Smith pointed to the wide, flat landscape before them. There were occasional bushes and small, squat cacti, but for the most part it was just dry, red-brown dirt speckled with the odd shiny stone. “You thaid it wrong,” chimed in the dizzy hat. “If it weren’t for me, you mean. I shot it.” Smith tapped his knuckle on the empty gun on his side, wincing slightly when the metal hit his thigh. “No, not like a map key to say what symbols mean. I mean an actual key, like a little metal thing, was drawn on the map, see?” Here Smith tapped his pen on the map, where he had indeed drawn a little key. Despite his dismissal, Smith still looked somewhat worried. Mel looked from the bronzing sky to the notebook dangling by the convict’s side then back again. “Oh, come on. It can’t be.” Mel grabbed his bag and tossed his niece back on top of his head, walking forward to the nearest spot on the ground where a shiny stone could be found. He picked it up and dusted it off on his shirt. Mel tossed the found object at Smith, who flinched before seeing what it was. 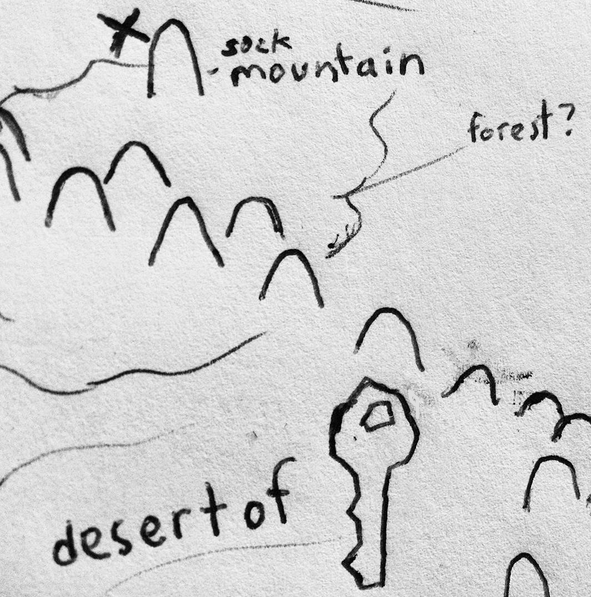 The shiny was a metal key, slightly eroded from the desert wind. Mel started to answer, but interrupted himself by falling face down on the ground. Fortunately, there were no cacti around to break his fall. Over cries of “Jesus, my ankle! Why am I always falling over things?”, Carla jumped off to investigate the thing which had tripped her ride. The sound of sharp metal rain thunking into the ground reached the ears (or, in Carla’s case, the featureless sides of her wheat bun head) of the three right as Carla flipped up a round, flat piece of wood. Smith, Carla and Mel jumped into the empty barrel before even thinking whether it would hold the three of them. As the wooden lid clopped down above them, phosphorescent light illuminated their surroundings. There were wooden hallways stretching several directions as far as the eye could see by the light of fungal lamps strewn across the walls. Above them, the hail of keys clattered and clanged against wooden manholes, hard ground and what must have been very hardy cactus flesh. This entry was posted in the red and the rest and tagged alternate dimension, barrelton, carla okabe, melchizedek okabe, rain, smith geier, the red and the rest on October 18, 2015 by robingarciawriter.